A Wake in the Undertow contains poems from the imaginations of Rich Theroux and Jess Szabo, the creative spirits behind Calgary’s Rumble House Gallery. Illustrated with drawings that emerge from “a brilliant truth like a well-lit hurricane” and that “despite all odds we carry on like the river,” the collection unveils two people in love as they disclose things survived, dig deep for sacred weapons, and endure cantankerously running on fumes. 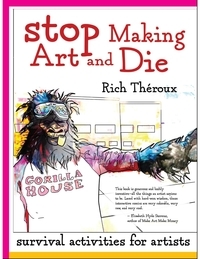 A Wake in the Undertow is a compelling work by Rich Theroux, the author of “Stop Making Art and Die: Survival Activities for Artists,” and Jess Szabo, a woman who radiates love, happiness, and generosity.